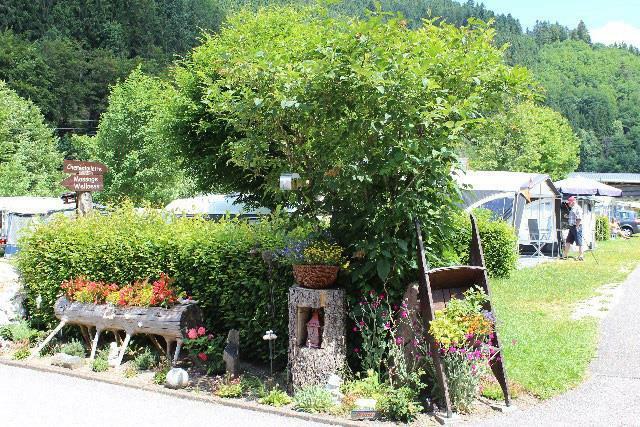 Schwarzwaldcamping Alisehof is a campsite with 110 touring pitches and 50 year round pitches. During low season, between 07-01-2019 - 11-04-2019, 29-04-2019 - 26-05-2019, 24-06-2019 - 01-07-2019 and 02-09-2019 - 03-11-2019, the nightly rate is €20,- at one of the 110 touring pitches at Schwarzwaldcamping Alisehof in Bad Rippoldsau-Schapbach (Baden-Württemberg). At this campsite you can not only use your CampingCard ACSI for inexpensive camping, you can also use your ACSI Club ID (as an alternative ID). A family campsite in the lovely village of Schapbach. A place to unwind. Wellness department. A quiet campsite, centrally located in the Black Forest nature park. Plenty of walking and mountain bike opportunities. The baby room in this campsite is incredible. It is situated in the more modern toilet block and you have to get a key to gain access... we weren’t told about the room by reception but fortunately another camper showed us. Camping pitches were a decent size, the bar seemed popular on an evening and there was a restaurant too but it only served pizzas. There is a little river running alongside the campsite. Having travelled extensively in Europe we have found this to be on of the best camps. The family running the site could not have done more to make us welcome and to make our stay a very happy one. All facilities excellent and location perfect. Will come again and strongly recommend to everyone. Only stayed a couple of days and were made very welcome by the owners and locals we used the cafe which has a very limited menu but the food was good, the toilets were spotless,and the shop had a few essentials,only problem was the weather rain rain and more rain, we would use again but better weather please. Nice site if the weather is good, however if poor very limited choice of facilities on site. Shop small, restaurant small and limited. Overall pleasant enough but fell short of expectation having stayed on many other 5 star sites. Sadly it seems that a star rating is not a reliable benchmark in choosing a site. My wife went into the shop and was told to leave as they only sever outside (Suspect that they thought she wanted a drink) which they only served outside. It was the night of Germany & Italy and they had a marque near reception. There is a small area inside where you can have a drink but we felt too intimidated to go in there, they advertise a restaurant which is no more than a snack bar as the only thing that was on offer was pizza or hot dogs (A fantastic restaurant in the village with a great welcome. )The shop which as advertised as having groceries had beer,some toiletries and bread if ordered the night before,nothing else. Toilets are adequate 3 toilers in each of 2 blocks.The sites are of reasonably size , Electric is metered so you have to wait until the owner connects you and disconnects. Don't know why this is rated a 5 star site when most of the facilities are not available.Wifi is available at a charge but only around reception. At events such as Musical evenings, barbecues, or in this case, the public viewing is our dining room closed, because these events take place outdoors. There we serve food and drinks with table service. We operate only a small Restaurant with a small menu card. Meals like pizza and Tarte or other regional snacks are offered. A restaurant business is not advertised by us. Our shop is very well stocked contrary to your perception. They get us food such as milk, eggs, butter, cheese and sausages, as well as ready meals, salt, flour, sugar and many other food and camping products. We are classified (Association of German tourism) with 5 stars by DTV guidelines. Nice peaceful site, lovely stream running along side the site. Good toilet facilities and laundry and washing up area. Beautiful surroundings. Kniebis Ski slop at top of the valley. Lovely site, beautiful surroundings, tourist tax includes a free bus pass, travelled to Freudenstat, which was a pleasant town, and worth going for the scenic bus ride at least. Friendly welcome and the owners put on a barbecue one evening those serving were more than willing to explain the different meats available and we were able to take the food back to the pitch. The electricity is metered, as on many European sites, and appropriately charged above the ACSI included allowance. The site is well located with superb pristine sanitation and washing facilities for example, 2 individual loos in the ladies have a bidet and the chrome fittings were ways gleaming, as were the washing machines etc. Good size pitches, wifi hotspot, near the bar. Comfortable bar and bar area, where we used the wifi and took our own drinks. Good walks etc from the site. Easily walkable into pretty village with restaurants and small well stocked supermarket/general store.Debit and credit cards accepted on site for an additional fee. Water points around the site. Hair dryers, soap, toilet paper, blade style hand driers. Excellent camp, the staff were kind and welcoming, after emptying the water gray expel us for parking. Had to wait until open the fuse box and write the counter before we connected to electricity. The next morning he came and cut us off and made the counter again, without telling us about detachment, without explanation or apology. Showers and services clean, has water hot free, a microwave and a washing machine and drying. Good WIFI connection near the office (surcharge). Do not allow to eat and drink near the office / store - only if you bought something in his shop. The place is clean and maintained better. Is right on the river, kids can get out and play it. Very friendly welcome from new owners of this campsite. Set in a beautiful area with many interesting places to visit within relatively easy reach. We are restricted with two dogs in tow but the towns of Freudenstadt and Wolfach are lovely and well worth a visit. Facilities at this site are excellent, showers are free and always spotlessly clean. Wifi available at 20 euros for the week which is good value. Cost of wifi varies considerably at different sites, 10 Euros for week at Neckargemund and 50 Euros at present site! Be sure and have the rolls in the morning, lovely! Restaurant facilities are basic to say the least, tinned or frozen. Would definitely recommend a visit to this site. Great site set in middle of Black Forest with river running next to pitches. Facilities all very modern and well kept. Good for walkers, local bus stop outside camp site but in good location to drive out and about. Very good camp site but some pitches are a little scruffy around edges. Good shop sold basics and local produce. Would you like to book Schwarzwaldcamping Alisehof or request more information? You can do both using the information below. A5 exit Offenburg, B33 Villingen-Schwenningen, which becomes B294 direction Freudenstadt after Haslach. After the tunnel at Wolfach, follow Bad Rippoldsau-Schapbach. CampingCard ACSI will send your information request to "Schwarzwaldcamping Alisehof".